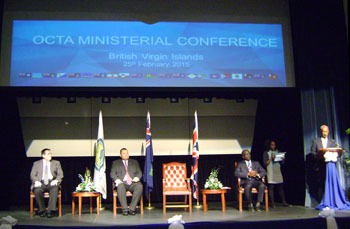 Tristan's UK Representative, Chris Carnegy, attended the 2015 EU Overseas Countries and Territories Association (OCTA) Annual Ministerial Conference and Forum in the British Virgin Islands. attending this event together with St Helena Hon Councillor Lawson Henry and St Helena UK Representative Kedell Warboys. 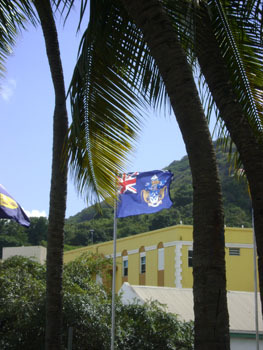 the Tristan da Cunha flag proudly flying in Road Town, capital of the British Virgin Islands and the venue for the meetings. 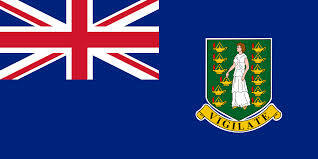 Other images courtesy of the Government of the British Virgin Islands. 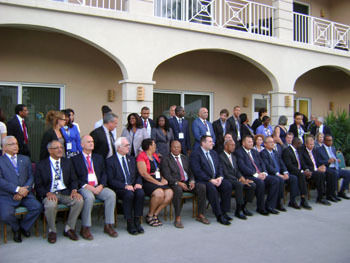 Led by the Chairman of OCTA and Premier and Minister of Finance, Dr. the Honourable D. Orlando Smith, OBE, the OCTs engaged with the European Commission at the highest level. 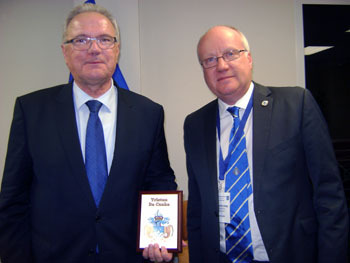 The European Commissioner for International Cooperation and Development was represented by Mr. Neven Mimica at the meetings. The EU encourages OCTs to recognise their economic, environmental, scientific and strategic value to the EU and the wider region can be developed through EU support for research and development in renewable energy, climate change, biodiversity, conservation, science and technology and other areas. Firstly all the delegates’ expenses are paid for by the EU. The key aspect of this event from Tristan's perspective is that the European Development Fund provides much-needed investment in Tristan. The most recent round of funding has supported the new water and electrical networks, the early trials with renewable energy and more dolosse for harbour repairs, among other benefits. Negotiations are now underway for the next round. So - although the EU formally only deals direct with St Helena - Tristan's aim here has been to raise positive awareness of how this European development cash helps with everyday life in the remotest settlement on earth. EU officials visibly brightened when I told them we now have improved street lighting - they deal with a lot of process and I suspect they don't often get thanked for the human benefits they help deliver. The meetings include (i) gatherings of the UK OTs to plan what we want from OCTA for the next few years: (ii) a meeting for our territory with EU officials and the FCO; (iii) a gathering of political leaders, and (iv) the annual OCTA forum. - Tristan was able to thank the EU for its help, including an encounter with the newish commissioner for International Development and Co-operation, Neven Mimica. I presented him with a plaque to acknowledge our gratitude. - St Helena UK Rep Kedell Warboys who organised our delegation was elected President of OCTA for the coming year. 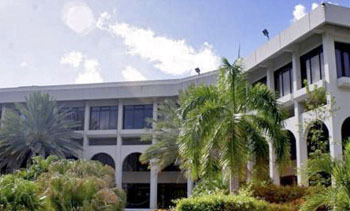 - Tristan was able to contribute ideas for ways to improve the future effectiveness of OCTA. - Tackling climate change (and dealing with its effects), and sustainable energy, emerged as two common themes for EDF-funded work over the next few years, alongside the support that will be specific to each territory. - delegates heard a presentation on SAERI, which is already developing links with Tristan and plans more work with us in future. The final 'Forum' day on 27 th February bought together all the week's participants: OT politicians and their reps; EU officials; and FCO officials / their counterparts from France/Netherlands/Denmark. Mostly it drew together the themes of the week, but one highlight has been Lawson Henry delivering a short speech on ambitions for renewable energy, better waste/wastewater management and sustainable fisheries across our Territory. It was good to hear him mention our new EU lobster access in front of such a powerful audience. with a Tristan da Cunha plaque. 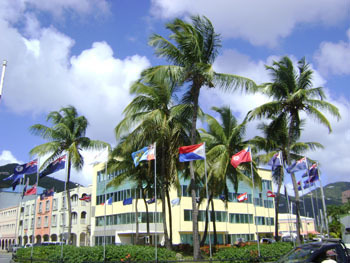 Images left of a British Virgin Islands Government Building and above a wonderful local beach scene.